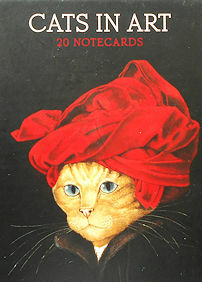 Here is a box of blank cat note cards that highlight the artwork of Susan Herbert. In her artwork, Susan Herbert re-imagined the art masterpieces and inserted cats. The artwork of Degas, Michelangelo, Blake, Vermeer, Renoir, van Gogh and more are re-imagined with cats. To get an idea of her artwork see the collectible book Medieval Cats. There are 20 cards & 20 envelopes in this box of cards. Previously owned but in good condition. Appears unused.